All the way from Africa - the past few weeks we've had these speedy visitors zooming along the canal feeding on the mozzies. I'm very sorry about the pics - but these tiny birds are just too quick for me to get a shot of. But I am so happy they're feasting on the mozzies! First of all we couldn't work out if they were house or sand martins - but after zooming in blearily on the pics - we saw the markings of both. The house martins spend much of their time on the wing collecting insect prey. Their mud nest is usually sites below the eaves of buildings & they're landing in Gainsborough Schools eaves - so we think they're there. They are summer migrants and spend their winters in Africa. The sand martins are agile fliers, feeding mainly over water. They will perch on overhead wires or branches - and are landing in the beautiful Sycamore tree along the river. Do yourself a favour - take a cuppa up to the Purple Garden in the evening after work & marvel at how many mozzies they are sparing us from with their acrobatics. Well look at how one of them is doing!! Unfortunately - the other one was vandalised last year - and isn't doing so well - but the one closest to the entrance is producing the sweetest cherries you'll ever taste in Hackney!! There are still a few greenish ones left - so please leave them to ripen & then treat yourselves to a lovely snack. 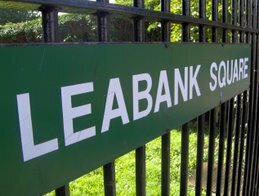 Well done Leabank Square Gardening Club! Simon Grennan & Christopher Sperandio are 2 of today's more interesting artists & over the past few months they have been showing readers of the Hackney Gazette just who's who in Hackney Wick. Last November Simon came down to Leabank square & spent a morning interviewing Nadira. The resulting artwork showed the vista all of us in Leabank Square used to see before the Olympics moved in. Simon interviewed about 20 other residents in Hackney Wick - and got many different views from all over the Wick & Fish island. It is great to see the Purple Garden getting a reputation for being part of London's Artistic Quarter. I know the swans are getting all the attention just now – but there is another family being created along the Purple Garden as well. One of the bird world’s best recyclers – the Coot – has dragged a dumped mattress just a few metres from the swans nest – and have just laid 7 eggs!! The eggs are slightly creamy (in colour! Don’t go frying any now will you?!) with black speckles. They’re about the same size as regular chickens’ eggs – and mum is very nervous. If you do go up to the garden – please don’t get too close to the edge – as she gets off the nest at any disturbance. But please do enjoy this beautiful spectacle right here under our noses! Leabank Square is encouraging all kinds of bio-diversity – in the face of monstrous adversity from across the canal. Well done everyone! Some of you might know that I have been a member of the Hackney Wick Partnership for a few years. We have been involved in trying to forge a desirable future for the Wick that respects local residents - as well as encourages the local creatives & existing businesses. We started doing this way before London was even considered for the 2012 Olympics. We have fed all our work into the Hackney Wick Masterplan, the Olympic Masterplan - and now the new Mayors (Boris that is) Development Plan. This weekend & next week is another opportunity for you to come & put your thoughts to the brilliant people at London Thames Gateway about what we would all like for the Hackney Wick Hub. This is the area both to the North (Tower Hamlets side) & South (Hackney side of the Hackney Wick Overground Station. There are major changes for the areas right next to the sloping ramps on either side of the station. And they would love to hear what you would like to see there. More cafes? A revitalised Lord Napier? Tree lined squares? Meeting fountain? Better welcoming open spaces? New routes/roads? Hotels? What would you like to see when you come home after a hard days work? What would make you meet your visitors coming off the Overground with a sense of pride about Hackney Wick? Please come down to 62 Wallis Road this Saturday 21st May - between 10am & 2pm. And also next Wednesday 25th May from 4pm until 8pm. This is a great chance for you to be part of our lovely Hackney Wicks future - please try & make it down for a chat!! Yesterday some kids got up onto the riverbank with an adult - and unfortunately smashed & knocked some eggs into the river. Thankfully a few witnesses have come forward - and the police are now dealing with the matter. But please could we beg everyone to be as vigilant as possible! There are only 4 eggs left - and this amazing couple need all the friends they can get to look after these remaining eggs. The swans are - understandably - very nervous now - and the cobb is not going on his usual territorial paddles. He is sticking right by the nest all day & night now. We have strengthened the fence that was damaged by the vandals - and hopefully they can't get to the nest as easily any more. But please keep an eye out for our swans. If you see anyone harassing or threatening them - please call the police immediately. They are very aware of what happened - and will respond as soon as they can.